I have a love / hate relationship with colour. I’m forever envious of people’s homes that are full of colour, character and are beautifully cheery. I’ve tried colour. And I can’t do it. I fully appreciate and admire brave colour palettes, but I just can’t do them. I get really uncomfortable when there are wild colours in my own space. I’ve tried to figure it out. I fought it for a long time, but I’ve learned to accept that I’m a colour-phobe and embrace it. I do have colours other than maroon / burgundy that I appreciate [I know, I didn’t think it were possible either]. Case in point – teal or turquoise viridian*. I wrote about my new colour crush back in September, but it kinda fell by the wayside. Until last week. I casually dropped into TK Maxx [the most dangerous kind of visit] and what did my eyes see? 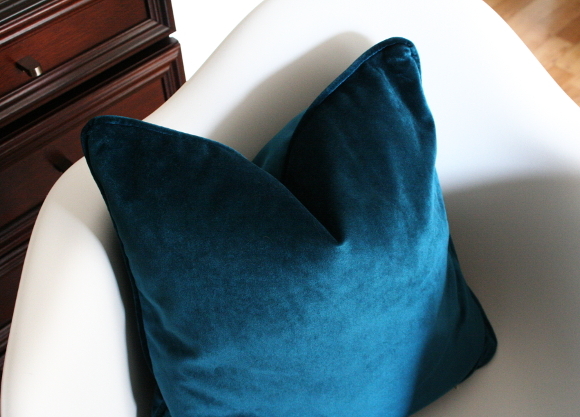 Only the most luscious pair of turquoise viridian velvet pillows. I actually closely resembled Gollum while I plucked them from the shelf; looking over my shoulder in case I’d be found out and my find would soon be compromised. I crammed them in my bike basket on Friday and cycled home. And so far, they’re not driving me crazy! They’re such a deep turquoise viridian and I think that’s what works. Plus, they’re velvet. But don’t expect to see loads more teal all up in here. Just little punches. *EDIT: we were discussing teal vs. turquoise over dinner tonight [I know, we’re so wild] when husband pipped up, “so turquoise and teal are like viridian then?”. There’s a reason I married that man. Viridian, for those of you who may not be as into Beetlejuice as I am, viridian is mentioned by Otho as a perfect blue-green colour for Delia’s bedroom. Is it starting to make sense now? Black and white stripes? Viridian? A serious aha moment. Oooh, deliciously deluxe! I love it – OBVS! What a lucky find. I'm trying to think if there is any colour I can't stand – I think I like most things, if they're done well. Although, not so keen on lilac, which I used to love – I cringe to think of my lilac bedroom now!!! Eeek. I knew you'd like them Maria! And I remember you had mentioned some time ago about my lack of turquoise goodness, but it's back! I had packed away all our teal stuff at Christmas and kinda forgot about it. I know how you feel re: lilac – I was the same! I had a thing for really bright green a couple of years ago. Cheap green. It wasn't nice and we still have some stuff in that colour (hidden away). Mmmmm…. 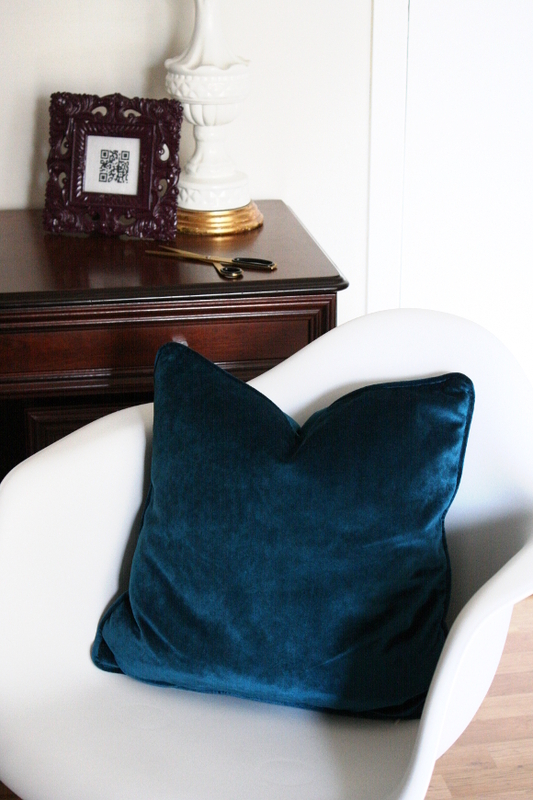 jewel tones…. (said in my best Homer Simpson voice). My M&S cover – your mention of jewel tones reminded me of it and my intention to blog about it. Woop!